Shelter – check, warm clothing – check, water – check. Well there really is only one critical consideration on any camper’s mind – food and cooking. And the best campfire cooking equipment has come a long way from the days when we raided the kitchen for cooking utensils and table ware. And, if you are old enough to recall, we often had pots and pans which were big enough to cater for a small platoon of campers. Thankfully, nowadays, there is a wide range purpose designed cooking aids, which are available in a variety of sizes, right down to just dinner for one. To give you a hand for the next campfire cooking trip, we are going to take a look at 10 campfire cooking tools that should be on your list. We are assuming that you have already taken care of the preparatory work, like heat, in the form of wood or butane / gel burners. And whilst taking a look at these 10 cooking utensils, we are going to do so through the eyes of campers of all types, and that includes both hikers and the more sedate folk, who take the time to set themselves up in almost home-like style. We get it that, cooking over butane burners is efficient, and largely fuss-free, but there really is nothing quite like the old fashioned wood campfire. And whilst this is the epitome of camping, it does present some challenges. The best campfire cooking tools should be able to remain useable and effective over flames, not to mention also cleanable. 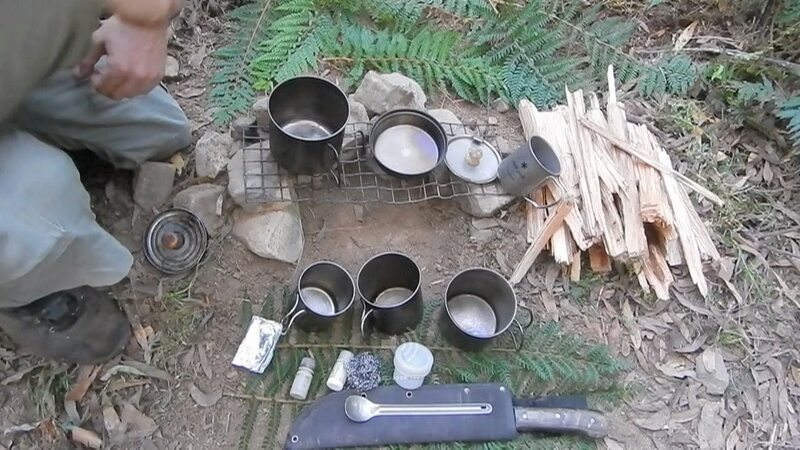 What Are We Looking for in Campfire Cooking Equipment? Anyone who has spent any time bent over the campfire knows, that one of the most irritating, and painful experiences, apart from getting smoke in your eyes, is burning your fingers or hands on handles and lids. So we will be looking at what manufacturers are doing to mitigate this. We’re looking for equipment with a sturdy base. Not only does this generally help the item or utensil retains its form, especially when banged around. But it also creates a large heating surface, good for quick cooking. Sure this adds to the weight, but does eliminate ‘hot spots’ typically associated with thin bases. Packing space is generally at a premium when camping, and even more so when hiking, so equipment and utensils with large openings are ideal for packing other stuff into. And it is more often than not, that we rely on the robust construction of cooking equipment in which to store breakables. Lastly, the material from which the equipment and utensils are made from is becoming increasingly important, and whilst at a premium as far as cost is concerned, stainless steel is ideal, if we can’t afford titanium. But cast iron, yes as old as the hills, still gives the best cooking result – as long as you don’t have to carry it around in your backpack. 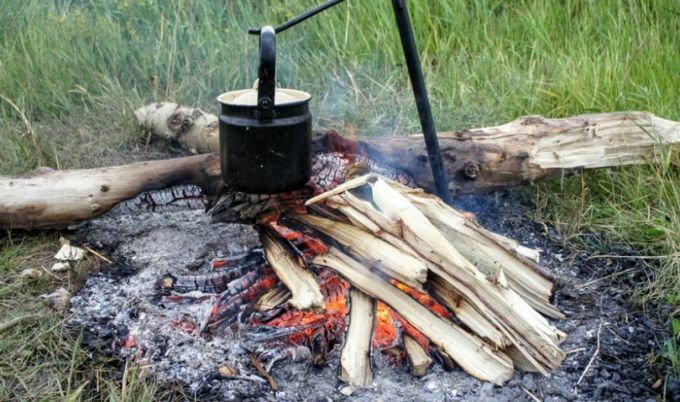 What Do We Need to Know About Campfire Cooking? There really is only one piece of really helpful information (or just a great tip) when campfire cooking; and that is the type of heat source. Orange flames do not necessarily provide the best heat, and generally do little more than leave black residue on your equipment. It is ideal to cook over a blue flame (this is where the heat energy is at its peak) and will generally produce very little black residue (soot). Apart from the black residue problem, orange flames also tend to burn plastic coated handles, or worse, your hands. GSI Outdoors Halulite Tea Kettle,32 Ounce. Size: 32 ounces – 6.3 x 3.2 x 6 inches (W x H x D); weighs 5.8 ounces. Specific features: broad based design, proprietary aluminium alloy steel, and anodized surface. Description: One of the GSI kettle’s defining characteristics is its broad base, and whilst this may present some challenges atop a small cooker or fire grid, the benefit of quick heating does outweigh this. Constructed from a proprietary aluminum alloy, it heats water quickly and evenly. GSI Outdoors Halulite Tea Kettle is light, weighing in at 32-ounces, so this one is ideal for the backpacker. The hard anodized surface, it is claimed, withstands scratches and abrasions. Whilst the bright orange coated handle and lifter looks cool (and should insulate a little of the heat), it will burn off if flames start ‘licking’ up the sides of the kettle. It also holds an ultra-light stove inside. GSI Outdoors Campfire Glacier Stainless Perc. Available sizes: 8 cups, 14 cups, 36 cups. Specific features: Stainless steel construction, glass knob, hinged lid. Description: As we mentioned earlier, any equipment made from stainless steel is likely to be long lasting. And marine grade stainless steel, which is the material used in GSI Outdoors Campfire Glacier Stainless Perc., is about the best you going to get. Now, it’s important to get the right size, since it is not possible to buy the 36 cup unit and expect to only brew a couple of cups – simply put, the unit needs to be at least half-filled in order to push the hot water up and through the ground coffee beans. The base is recessed (to be expected with any utensil which is ‘welded’ as opposed to being produced in a mould), and so this unit would be ideal for a butane burner or campfire, and not so effective on a flat top cooking surface. Expect a bit of trial and error when determining the right grind of coffee, to ensure that you don’t end up with too much coffee sediment in the pot. And always bear in mind that any stove top percolator will burn the coffee if left over heat for too long. Gauge your desired coffee strength by the color of the coffee when viewed through the glass knob. A bit of practice will give you your best result. Description: Now OuterEQ 8pcs Lightweight Outdoor Camping Hiking Cookware is a great little backpacking set, and at really good value. They really have thought of it all, including a ladle and cleaning pad. This outdoor cooking set is designed for one or two people. Anodized aluminium construction gives you a robust cooking set, and foldable handles make packing a breeze. Some would say that the handles are a little short and, as with most cooking equipment they are plastic coated. It would be fine for open flame cooking, but best with a gas burner. Probably be best for a single person, if you are the hungry type. The images may create the impression that the components lock together; they don’t, and so a mesh bag is important. The free swinging handles can also be a bit of a problem, manufacturers should consider a handle lock-in-place mechanism, but then again at $16.99, there is only so much that can be provided. Sizes: 1 x 7″ fry pan, 1 x 1 quart boiling pot, and 1 x 1.5 quart boiling pot. Specific features: Non-stick coating, good for two hungry campers, includes a storage bag. Description: Texsport Black Ice The Scouter 5 pc Hard Anodized Camping Cookware is an awesome backpacking cooking set, made from hard anodized, non-stick aluminium, which makes for easy cleaning and healthy cooking. As with most of the designs in this category, the folding handles can present a problem when folding back against the pot during cooking. The all-in pack weight is 26 oz. Sizes: 4 x enamel bowls, 4 x enamel plates, 4 x enamel mugs, 4 knives, forks and spoons. Specific features: Stainless steel edged enamel tableware. Description: Stansport 24 Piece Enamel Camping Tableware Set provides a very effective steel coating for tableware, and cookware for that matter, but it does have one drawback, enamel is very prone to chipping, particularly along the edges, and this exposes the underlying steel, which quickly oxidizes and results in rust forming over the exposed areas. Stansport has definitely thought this problem through and has manufactured this tableware set with a stainless steel edge. The cutlery is little on the ‘cheap’ side, and is not likely to endure too much wear and tear, and the mugs are good for a few gulps, and that’s about it. But for $28.34, we really can’t expect a great deal more. Sizes: Deep Skillet Base: 10-1/4″ dia., 3″ depth. Shallow Skillet/Griddle lid: 10-1/4″ dia., 1-1/2″ depth. Specific features: Pan set includes 3.2-Qt. Dutch oven and 10.25-inch shallow skillet that doubles as a lid. It weighs 13 pounds. Description: Now Lodge LCC3 Pre-Seasoned Cast-Iron Combo Cooker, 3.2-Quart is clearly not an option to slip into your backpack, unless you are keen on a really good work-out. You are either a fan of cast-iron cooking or you are not, and if you are not, it is likely that you haven’t tried it yet (and we suggest that you do). The Lodge cast-iron combo is a fantastic option for those who enjoy this type of cooking since the shallow skillet also serves as a top for the deep skillet, and yes this is also handy for baking. Cast-iron cooking equipment needs to be seasoned, and it gets better the older it gets. In time you will get an effective non-stick surface. Don’t be afraid to use a bit of sand paper to polish off the rough edges at the bottom and sides of your pot or pan. Made of iron, they are going to rust, and this should not alarm you, in fact a bit of iron does wonders for your diet. If the cooking surface of your utensil is already smooth, simply scrub out any wax which may have been added prior to shipping with a household detergent. Next wipe on some cooking oil and ‘bake’ the utensil in the oven for a couple of hours. We’re looking to bake it until the pot or pan starts to smoke, then switch off the oven and leave the utensil to cool to room temperature before removing, and wiping away the excess oil. After this, you are ready to cook. Set includes: 1 x 9-inch fry pan lid, 1 x 5.5 qaurt cooking pot, 1 x 1.5 qt stewing pot, 1 x 6 cup coffee pot with lid, 4 x plastic plates and cups, plastic salt and Pepper shaker and one frying pan handle. Specific features: Aluminum and plastic cookware and tableware set. Description: Just when you think that they have thought of it all, they go and add measuring levels to the cups. This is an awesome idea when you need to follow meal preparation directions. Stansport Deluxe 16 piece Four Party Aluminum Cook Set is lightweight and has a really good value. Don’t forget to throw a can of non-stick spray into your bag, and you should be sorted. The pan handle is removable to allow the pan to act as a lid for the pot. At $22.59 expect the plastic plates to get a bit warm, and the odd dent is likely to happen, but nothing that a bit manipulating won’t fix. And it is probably worth tossing out the salt and pepper shakers, they are prone to opening when they are not supposed to. The set nests together nicely. Specific features: A simple enamel pot. Description: Stansport Steel Enamel Straight Pot (Royal Blue, 6 1/4-Quart) is a lead free, durable enamel coated, cast steel pot. Specific features: Stainless steel and corrosion resistant. Description: Coleman 12 Cup Stainless Steel Percolator is completely understandable that when one sees the Coleman brand, one expects a fair amount of product quality. This is probably the reason there are numerous complaints about the glass top. Or, are we simply expecting too much from this percolator? We don’t think the latter applies, and Coleman should really supply an extra glass top or two, as it is inevitable that a few blunders are going to happen, before learning that the glass top should not be screwed on too tight. Easy to disassemble does mean easy cleaning, but it also means that a bit of extra care is needed to keep all the components together. Size: Stands 4.1 inches tall, 28 oz. Specific features: strong titanium material, good for one camper. Description: We have covered, cast iron, aluminum, stainless steel, and now it’s the chance of the premium material – titanium. MSR Titan Kettle will take care of weight and strength concerns, at a price of course. Big enough to cook in, store a fuel burner in, and small enough to use a cup. And yes you going to find a far cheaper alternative, but the pouring spout and lid is a real plus. And you are also going to need a can of non-stick spray for anything other than heating water. There was one point that we mentioned at the beginning of our review and that was the bit about ‘handles’ which are prone to getting really hot. Now we get that there is a bit of a trade-off between designing handles which are made of ceramic and not wanting to add too much weight and cost to the cooking utensil. It would appear that we are still far away from designing the perfect handle, which is not costly, and adds too much weight. Until then, a bandanna makes for a good insulator, if you don’t have gloves. We would like an alternative to using a paper clip to hold the foldable handles together and away from the pot. And maybe a little more resistance so that lid-mounted wire handle stays erect while cooking and doesn’t drop down to the side. Also, we would like the lid in that ideal place where it can’t catch a few wayward flames, making it too hot to handle. Having said this, campfire cooking equipment has come a long way indeed. Lightweight (for the most part), durable, occasionally non-stick, and most importantly produced by reputable manufacturers who are competing aggressively for your hard-earned cash. The items we have reviewed cover the four essentials: heating water, brewing coffee, cooking, and tableware. There is just one thing left to do, since you know you have to get out into the wilderness. And that is to plan your next adventure! Only this time, ensure that you have one or more these items in your kit.